New York magazine reports of a new issue of Esopus, one all about television. 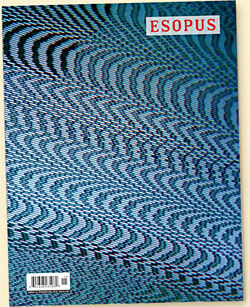 Esopus — a beautifully made art magazine, printed on thick, pretty, old-media-fetish paper — just landed on my desk. It's their television issue, and it looks fantastically strange. There's an interview with Lisa Kudrow and Michael Patrick King about The Comeback; there are extended reminiscences from legendary soap-opera director Larry Auerbach; there's a Norman Lear deconstruction of a mad scene from Mary Hartman, Mary Hartman; there are pages of solemn-looking stills from an experimental television film by Fassbinder. Some of the best bits are painstakingly reproduced documents, like a hilariously comprehensive As the World Turns continuity folder, which includes full character names ("Kimberly Sullivan Reynolds Dixon Stewart Andropoulus Hughes") and an appendix of special character-related notes: "John Dixon: deathly allergic to scallops." Who knows, this may be the most pretentious thing ever — there's a faint but undeniable air of highbrow contempt wafting off the table of contents — but it looks at once delicious and potentially infuriating. I will keep you updated. So far, it appears to be the first magazine about television designed for people who never watch television. In any case, it does contain the best pull-out poster I have ever seen, a "removable poster with unidentified images of 64 television sofas." I am going to have this sucker framed by the end of the week.